Add warmth and beauty to your home with this hand-painted Dale Tiffany table lamp. Pull the chains to turn on the two lights of this alluring hand-painted table lamp. A tropical scene of birds and flowers glows on the softly curved glass shade. 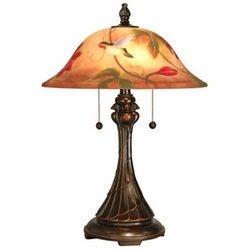 Antique golden sand finish on the base reinforces the vintage tropical feel of this design from Dale Tiffany. • Dale Tiffany table lamp. • Antique golden sand finish. • Hand-painted art glass shade. • Takes two maximum 60 watt standard base bulbs (not included).